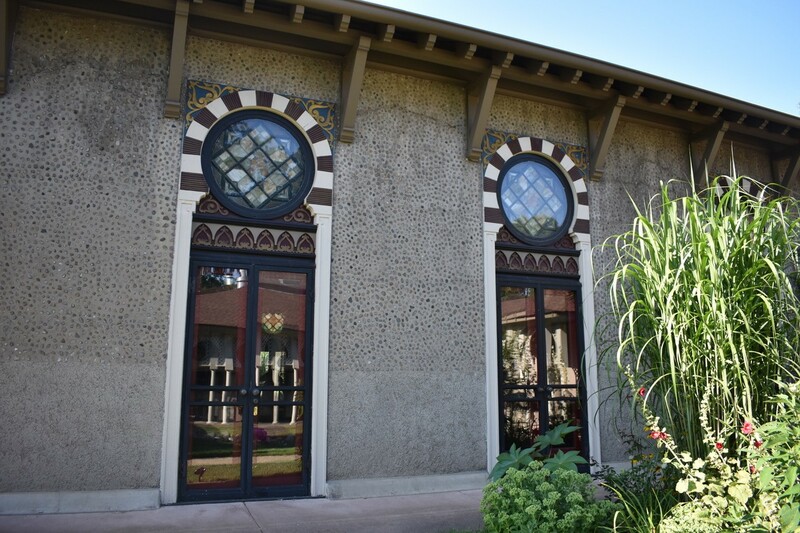 This summer I embarked on an expedition to the Midwest for thesis research on nineteenth- and turn-of-the-century Islamic architecture in American domestic and religious spaces. I refer to this journey as the “Thesis Research Road Trip Adventure” because, little did I know, my choice to drive to each site would lead me to refocus my thesis and make larger connections between architecture, place, and exchange. The hours spent driving alone provided an opportunity to reflect on my site visits and process the information I absorbed on each trip, leading me to newfound insights. Each location I visited had a unique story with varying degrees of documentary evidence to support the idea that there was a revival in Islamic architecture in the nineteenth and twentieth centuries. I first traveled to Cincinnati, Ohio, to visit the Plum Street Temple, a Reform Jewish synagogue built in 1865 and dedicated in 1866. It is known as the Isaac M. Wise Temple, the congregation’s rabbi until his death in 1900. The synagogue is a hodge-podge of stylistic influences: Gothic and Neo-Byzantine influences on the exterior and a lavishly decorated interior heavily inspired by the Alhambra in Granada, Spain. I enjoyed visiting the well-preserved synagogue and admiring the stencilwork seen throughout the space. My second destination was Quincy, Illinois, located along the Illinois-Missouri border. The Villa Kathrine (1900), a Moroccan-style villa sits atop a hill overlooking the Mississippi River. 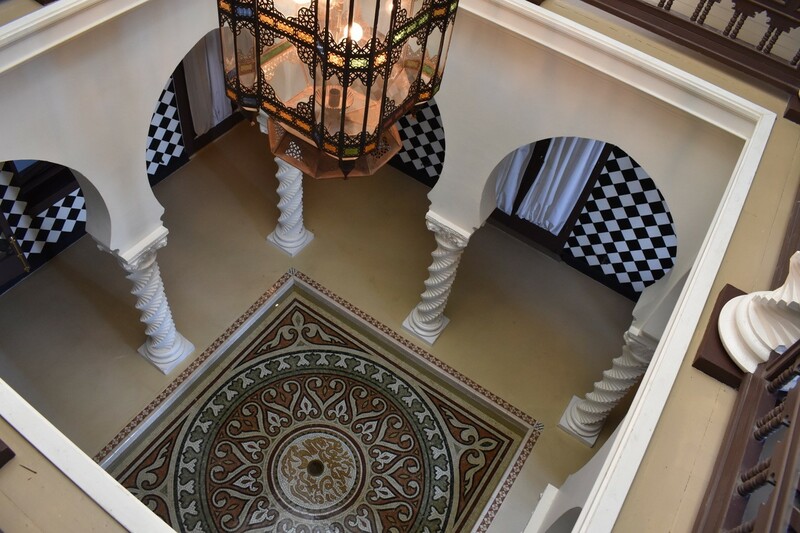 According to local lore, George Metz traveled throughout Europe and North Africa and during his travels in Morocco he encountered a beautiful villa. He brought sketches of this villa back to Illinois and immediately commissioned a house in the villa’s likeness. It features an interior courtyard, three bedrooms, and a faux harem. The house underwent restoration back in the 1980s, so I spent a great deal of time examining the villa and furnishings to determine what was original. The final destination was a private home in Stillwater, Minnesota. The structure was originally a recreation hall in 1902. It was an attached addition to a nineteenth-century Victorian mansion. Created by lumber baron William Sauntry, the recreation hall featured a ballroom, bowling alley, and swimming pool. In 2008, the current owners began a 10-year-long project to restore the site to its 1902 floor plan. It was converted into a triplex before their ownership. Touring the home and examining each nook and cranny was an absolute treat. 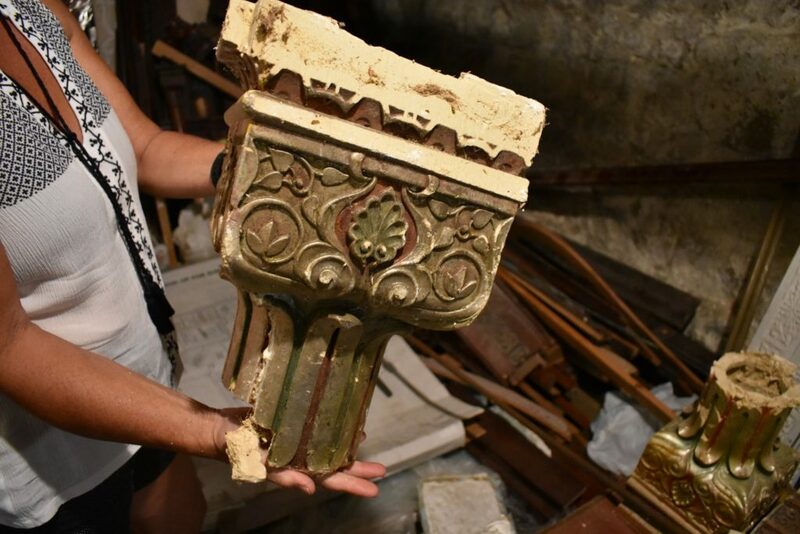 I even explored the basement area to see the intact pool lining and some original plasterwork and capitals. Driving to each architectural site prompted me to think critically about the sense of place, time, and experience. My decision to drive was a practical choice—it was more economical to drive than to fly to four separate locations. However, interstate and city roadways allowed me to think about the distances between each architectural site and consider how travel and transportation could factor into the dissemination of Moorish Revival architecture. I noticed that each city or town I visited—Cincinnati, Quincy, and Stillwater—were situated along the river. I wondered whether waterways and the circulation of goods helped bring Islamic design vocabularies to these places by way of coastal port cities in the Gulf South or East Coast. 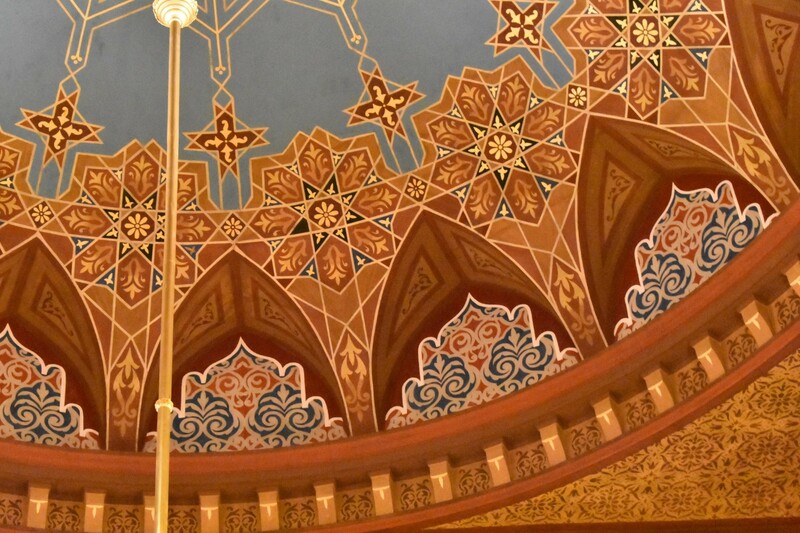 While I initially thought my thesis would explore Islamic architecture broadly, I was surprised to uncover a Midwestern story of Moorish Revival. After reviewing my thesis plot map, it seems that early twentieth-century buildings were branching into other cultural or geographic influences that would have expanded my interpretation of the architecture. However, the nineteenth-century and turn-of-the-century examples were looking to Moorish Spain and North Africa. 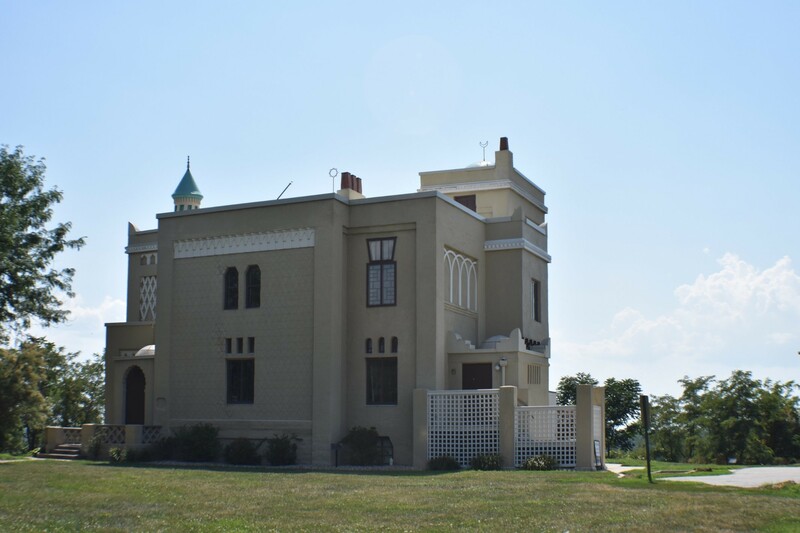 With newfound insights in hand, I am eager to uncover and reveal more about the use of Moorish Revival architecture in the Midwest. This entry was posted in Academic Programs, American Culture Studies, antiques, Architecture, Design, Students & Alumni, Uncategorized and tagged antiques, islamic architecture, lois mcneil fellow, midwest architecture, moorish architecture, Winterthur Museum Garden & Library, Winterthur Program in American Material Culture. Bookmark the permalink.